If you want a great example of later Ben Webster, this recording – splendidly reproduces Ben’s glorious, utterly unique rich sound. The audiophile recording in a small theatre directly to a two track tape recorder, is further enhanced through the 2xHD Fusion re-mastering process. 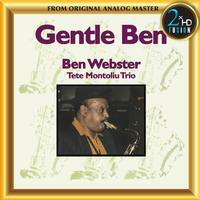 The title ‘Gentle Ben’ was inspired by the warm and gentle atmosphere created by Ben during this, his last recording session before his death. The bluster has gone and he could caress a theme like ‘The Man I Love’ with tenderness. One of the paradoxes of Ben was that in person he was quite an aggressive man but in his music he was gentle, seductive and sensual. Pepe Montoliu is himself a virtuoso but here he is the supreme accompaniment. If you want a great example of later Ben Webster, this recording splendidly reproduces Ben’s glorious, utterly unique rich sound. The mastering chain consists of a selection of high-end vacuum tube equipment. For the recordings on this album, the original ¼” 15 ips CCIR master tapes were played on a Nagra-T tape recorder, modified with high-end tube playback electronics, wired with OCC silver cable from the playback head direct to a Nick Doshi tube head preamplifier. The Nagra T, with its four direct drive motors, two pinch rollers and a tape tension head, has one of the best transports ever made. A custom-built carbon fiber head block and a head damping electronic system permit 2xHD FUSION to obtain a better resolution and 3D imaging.